Memories last forever. Create beautiful memories when you send this elegant wooden trunk with a domed lid filled with the finest in gourmet foods for that special customer, couple or family. 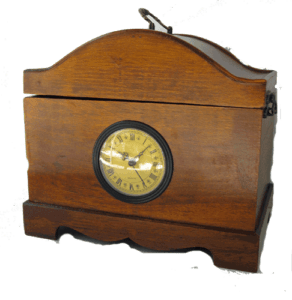 These gorgeous wooden keepsake trunks with a battery-operated clock in the front are no longer available from our supplier and we only have a limited supply of them so order early. We fill the wooden trunk with gourmet goodies including crackers, cheeses, cookies and more. We complete the gift with one of our gorgeous hand tied bows and include your personal gift card. This unique gourmet gift is ideal for any kind of celebration -- anniversary, birthday, wedding, or any other occasion. Help them celebrate with this unique gift idea today. This gift can be shipped or hand delivered in Flagstaff, Arizona.